The gun emporium will occupy the space vacated by a women’s gym and will join several popular mom and pop businesses along the strip: a restaurant, a flower and gift shop, an art framing store, and a hair and nail salon. Life in the Boomer Lane has, for the most part, stayed away from this hotbed of controversy. But she admits that this recent reminder of the penchant for Americans to own and carry firearms calls for some explanation. She hereby gives it to you. A note to readers: LBL writes satiric humor. She takes topics to their ridiculous extremes. While this blog is open to anyone who has nothing better to do than to read marginally amusing content, LBL requests that she not be subjected to comments with all of the reasons why gun ownership is the most important right we have ever had in the history of the planet. She has heard it all before. The NRA does a much better job than you do of promoting gun ownership in this country. At last count there was one gun for every single man, woman, and child in this country. She hereby publicly states that your penchant for firearms doesn’t mean that you don’t love your children and grandchildren and pets. It doesn’t mean that you aren’t kind to your mother and remember her on Mother’s Day. It doesn’t mean that it doesn’t hurt your heart when you have to kill insects in your home. It doesn’t mean that you aren’t a law abiding, responsible person, who gives money to those people who stand on medium strips with signs and money jars. In other words, LBL thinks you are probably a good, decent, caring person who she would be perfectly happy to have to dinner, but not to run into in a dark alley some evening. When God created the United States, with the help of a bunch of white guys who were God’s own image on earth, he gave us the right to bear arms. This was because we didn’t have a national army, so we had to depend on local militias of loyal citizens armed with squirrel guns. After awhile, when we beat the Brits, we didn’t need a militia anymore, since we created a real army. That said, there were a lot of people living in places in which they actually needed rifles in order to put food on the table. A national gun lobby was created shortly thereafter, to make sure that people got to keep their guns. Their original motto was “If It Was Good Enough for God, It’s Good Enough For Us.” Because Americans were chosen by God to have their own country, and because they are extremely plucky and creative, they took God’s word at face value and started assembling arsenals of assault weapons in their homes. Soon, America became a country of loyal, gun-toting citizens, who justified their ownership of assault weapons as a natural and logical extension of owning a rifle to use during deer hunting season, or protecting their suburban homes from foreign marauders or anyone else of whom God didn’t approve. This all worked pretty well until people, including a popular Conservative President of the United States, and a lot of school children, started to get shot at. A few misguided folks started making noises that maybe it wasn’t such a great idea that there were so many guns around that were accessible to everyone at a moment’s notice. The NRA countered that maybe if the President and all the little school children had been toting their own guns, nobody would have shot at them. While LBL knows that the above is a corruption of the wording in the US oath of office pledge (“defend the Constitution from all enemies foreign and domestic,”) she isn’t quite sure what this means in this case, since most people aren’t allowed to toss their own finely tuned fighting machines into a suitcase and fly to wherever it is that foreign enemies live. And the domestic variety, unless they are actively engaged in enemy-defining behavior, are pretty darn hard to recognize. Depending on which source you read, we are either at the top of the international heap in gun ownership and pretty close to the top in murder rate (i.e. : more guns equals more violent crime) or we aren’t. Research on the side of we are is abundant. Research on the other side is either endorsed by the NRA or funded by the Crime Prevention Research Center, an objective group founded by John Lott, a popular gun rights enthusiast. The debate would have been quelled a long time ago, but it continues to rage, thanks to being funded by the gun lobby. LBL suspects that if there weren’t a very large buck to be made (and shot at, on occasion), most gun sales would revert back to hunting rifles and whatever is used for target practice. ← Be A Better Mom. Go to Work. Good post. We have unfortunately moved beyond reasonable discussion over good governance over guns. Most gun owners are receptive to better governance over gun ownership. Oh man, not bacon cheeseburgers? I’m gonna write you in for president. We need some sincere humor in Washington. Washington has turned into a bad joke, with all the super PACS footing the bill. All I know is that we continue to read every day of more people being shot and killed by nut cases with guns. Guns kill people, and continue to do so at an alarming rate. Our spineless leaders in state and federal legislatures, as well as governor mansions and the White House lie cowering before one of the smallest lobby’s out there. Meantime, even our young children continue to die. The land of the free and the home of the stupid. As someone who has worked in law enforcement for three decades, I am ambivalent toward guns. It would be nice if the only people who had them were cops. At least then, the firepower would be in only one direction. On the other hand, I worked on a study for the concealed carry law in Minnesota that revealed gun owners to be, other then toddlers, the most law abiding demographic in our society. 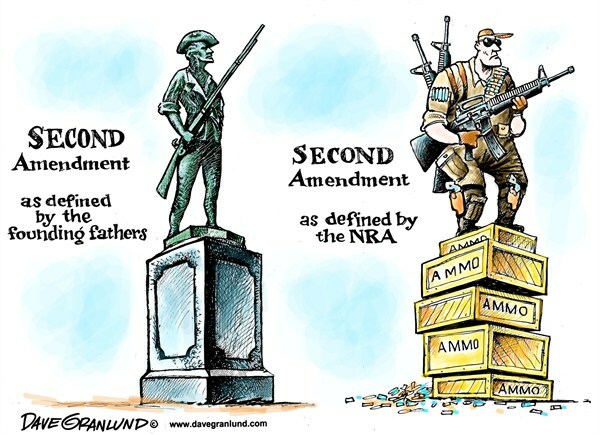 IMHO, the problem is not the second amendment but the first. Hollywood is obsessed with guns and gun violence. Far more people die by gunfire on television every year than do on even our violent streets. We do not live in a gun-culture, we live in a shoot ’em up media culture. There is a difference between the two and it is an important one. I also read a fascinating report describing the viral nature of media culture, even in places as far-flung as Hong Kong and Sao Paulo, gangs emulate the language, the culture, the weapons and the craziness that they see in films like The Godfather and Scarface. Last year, a number of Hollywood stars participated in a public service commercial speaking out against gun violence. Shortly after, a YouTube video appeared splicing their words with the gory scenes they had acted out using firearms. Hollywood tends to push the envelope on guns and violence, as does the video gaming industry. We have a general culture of violence here that, like fast food, is emulated in other countries. But I do think the issue remains that the gun industry, in their line-in-the-sand belief that any gun control takes away personal rights, continues to promote the unneeded escalation of gun ownership, as well as the sale of arms that are better suited for the military than for personal use. As with violent films, the dollar rules. C’mon, we are boomers. The furthest flung outpost of personal liberties is the hallmark of our history. It is the story of our generation, we take all liberties to the extreme. We scratch every itch. It is what we do. Blaming the gun industry for military style weapons is like blaming Hugh Hefner for dirty pictures. Hugh did nothing more than satisfy a demand that the Supreme Court said could be satisfied. Do we blame Planned Parenthood for pushing abortion? Still, personal liberties won the day. Personal liberties will always win the day, it is what we do. What I am seeing in these comments is a fear of other people. Of people who do not share our values and send out signal that they are not only not of our tribe but are of a tribe who represents everything that we generally oppose. Well, I will tell you a story about that. I live in a little town in rural Southern Minnesota and we have a mighty strange phenomena going on around here. We are having a massive wave of immigration from Somalia, Ethiopia, South Sudan and Myranmar(Burma) into our small towns. Places like Faribault, Austin and Owatonna are seeing their school systems absorb ten and fifteen percent of kids who not only struggle with English but struggle with American culture. The interesting thing is, we are asking our locals, often redneck, gun-toting, pickup driving rural people to extend a hand to Muslims refugees from Somalia and a surprising number of them do just that. So my advice is this, though you might not like where these people are coming from, for your own sake, stop by the gunshop, introduce yourself, welcome them to the neighborhood and find out what kind of people they are. If they are jerks, then so be it. If they are good people then you might make a friend. Tolerance is not getting other people to see your position, it is all about doing what is hardest for you. As an aside, I have no interest in defending the position of gun owners. Guns are not something I am into. What I would like to address and stress is tolerance. Our generation held tolerance as the highest of its values. Many of us, marched for the civil rights for women, minorities, gays and immigrants. We spent most of our lives asking others to be tolerant of people who they were culturally conditioned to be intolerant of. We asked others to make the hard moral choices. What worries me, and what makes me (unwisely perhaps) speak out – is that we are losing our most cherished value. I see growing intolerance among political progressives, the very people who should be the most tolerant and I despair. In a world that is becoming one, in a place where religions and cultures, many of whom are themselves intolerant, are coming together, how can we hope to get along if the model of intolerance has been tossed aside and trampled on. I spoke of all the immigrants who are flowing into our area. It is very challenging because of intolerance. The South Sudanese hate the Somalians, the Ethiopians don’t like either. The Colombians look down on the Mexicans and that is just the tip of the iceberg. Among each and every one of those groups there are subgroups who despise each other. How can we, especially the progressives, ask them to throw away thousands of years of conditioning, when we cannot tolerate the shop down the street and their weird hobby? Tolerance is not about what others do, it is only about what YOU do. Add to the list the nonsense about the Constitution being under attack, the specious complaints and fear mongering about this are tedious already. After watching the Ten Commandments per an assignment in class to teach about Judaism, funny I know, I told my daughter that my grandmother deeply disliked Mr. Heston because of his pro gun stance in the world. She reacted in genuine shock, she said, “They WANT people to have guns?” Exactly. Why? Insane. So I did not make an attempt at a funny reply, I will leave the humor to you LBL but they really do need some humor in Washington, and fast. I like your tag line, I would respect the NRA a lot more if they adapted your slogan instead of telling me that they are fighting for me and out to protect me, which is exactly what my ex husband the gun lover said, who by the way also threatened me and thereby my children with the guns. We have a right to not like them and the Constitution protects our voice against them. The gun industry will continue to equate gun ownership with its version of personal freedom, at the expense of lives. They have responded to violence with the the answer of more guns. When every single man, woman, and child is packing heat , we are reduced to one big shoot out. Yes, they also participate in victim blaming and shaming. If you are a victim of domestic violence then according to them you SHOULD have had a gun and stood your ground and then the whole scenario you endured would have been avoided, so it’s sorta your own fault for not having a gun and supporting their cause and choosing to shoot the abuser. One of the last things an abused person needs is a gun to kill the other parent of their children which would result in them ending up going to court where sexist members of the NRA would be potentially sitting on the jury to possibly send her to jail for murdering the man she “should” have submitted to and not made angry thus leaving her children with zero parent. Oh yeah, then to protect themselves the kids should buy a gun since they have no parent. Insane. I don’t understand their stance against gun licensing. It would attempt to ensure that firearms would not be in the hands of criminals and those not mentally able to use them responsibly. There are civilians who really need to protect themselves, and I’m sure many could easily prove their worthiness to own and use a gun. The rest, well, don’t be a freakin’ criminal then! Ban all gun show sales. That’s how a lot of unlicensed weapons are winding up in NY. Let’s be reasonable, NRA. Do you really want to advocate for violent people? Great post. Thanks, Linda. “Personal freedom” has been used by the gun industry, as well as by certain political factions, to promote personal irresponsibility. Sugar does not kill people, candy bars do…or words to that effect. While sugar does, indeed kill people, it’s more like a suicide than a murder. I believe that the NRA does not have a common sense cell between the group. Perhaps if they obtained some sense this conversation would not exist. Yes, so many of the guns that are sold are better suited to soldiers, not citizens. There is no argument on earth that will convince me that people need arsenals of assault weapons. Oh wait, “person freedom.” Right. There isn’t an army on Earth that equips its soldiers with semi automatic weapons. Fact. Armies, including the US, do indeed have semi-automatic weapons in their arsenals. And let me be very clear about this, Gdogs, my editing out of your comments had absolutely nothing to do with avoiding “truth.” Gun control, like abortion, is an issue that has people divided along very clear lines. Each side has compelling reasons why they are right and why the other side is wrong. There is virtually nothing one can say that will cause someone to change sides. Almost Iowa’s comments are included, speaking for the other side. Yours aren’t because you used the phrase “gun haters” to characterize my readers. For me, that crosses the line from commentary into accusation. And for the record, I don’t hate guns. What I dislike is the inability of this country to regulate gun use. I’m not allowed to exceed the speed limit when I drive. I’m not allowed to drive on the wrong side of the road. I don’t see people marching to say that those laws infringe on my personal rights. As for the Second Amendment, that was written at a time when we maintained a militia. It was necessary for our survival. I’ll stop here. As I said, people are on one side or the other. I don’t require that you change your belief system. But I do require, if your comments are going to be visible on this blog, that you be civil. Just great. Think people should reread “Thank you for Smoking ” and remember that the MOD (Merchants of Death) squad included lobbyist for tobaccco, alcohol (Moderation Council) and S.A.F.E.T.Y. (Society for the Advancement of Firearms Effectiveness Training and Youth. Too close for comfort. Thankfully we have better laws in Australia. Great post and I love the cartoon. I really don’t like the idea of people keeping guns for home defence but if they must do they really have to have military style assault weapons. The gun industry continue to promote military grade weapons. What’s next, bombs people can stockpile at home? We often have better controls over who gets behind the wheel, than who gets behind a gun. Reasonable people can disagree, but when it comes to the NRA and gun zealots, there is just no reasonableness. It is one thing to debate the legal aspect of the second amendment and to what extent the right to bear firearms, but their argument “guns don’t kill, people do — so guns are not the problem” is absurd. One can say the same about any kind of weapons. So chemical, biological, and nuclear weapons, anyone? The NRA is an outstanding lobby. Their success rate has been mighty impressive. My favorite is that every time a gun tragedy occurs, the NRA promotes more gun use as the remedy. It’s brilliant, really. Renee, your wonderfully written post has elicited some good comments. I commented earlier, but have been following later discussion. I agree the NRA is a well-oiled machine, which is the key reason politicians are scared of them. They can mobilize a local passionate army in each voting district and sway outcomes, especially when so few folks turn out to vote. The other thing I would add is the NRA does not represent most gun owners and, in fact, represent gun sellers more than any group. Per a recent Elon University survey, even conservative voters advocate for better background checks and extended waiting periods. Once upon a time, the NRA represented gun safety and responsible ownership. I believe those missions have diminished in priority. I totally agree, LBL, and the image in your post speaks volumes. Thanks, Gail. The controversy over the neighborhood gun store continues. To the credit of the young man who owns the gun store, he has been wonderful. He has listened to us and seems to really appreciate that it wouldn’t be in his best interest to be in a neighborhood that would have serious reservations about his being there. While it’s not a done deal yet, I’m encouraged. Kudos to all who put dogma and accusations aside, in favor of true, meaningful communication.